The end of Legion is near. From a creative standpoint, FX's Legion has been a tremendous success for what started out as an odd spinoff of the X-Men franchise. And perhaps that has to do with it not really resembling a superhero show at all, but a psychedelic journey through one maddeningly unstable mutant with power to alter reality. Today at the TCAs it was announced that season three of Noah Hawley's series will be its last, and that's exactly what the showrunner planned from the start. 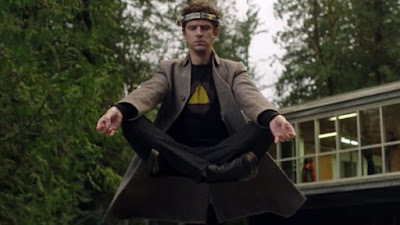 That sounds like we won't be seeing any more of Dan Stevens' powerful schizophrenic mutant telepath, David Haller, even though Marvel TV's Jeph Loeb expressed interest in Hawley returning with more stories at some point. The final season won't be coasting to an end, though. The wait is finally over and David's father, X-Men founder and leader Professor Charles Xavier will arrive, played by Game of Thrones actor Harry Lloyd. Joining him will be Stephanie Corneliussen as Gabrielle Haller, David's mother. It's unclear if any other notable X-Men characters will make appearances, although the show's link to any established continuity has been tenuous. While Stevens isn't happy to see the show end, he certainly isn't disappointed by what they've accomplished.